To provide Pet Oxygen Masks to Fire Departments and other first responders, providing your pet with the best chance of survival from home fires. To provide a platform to encourage a pet savvy public, through Pet Safety, Emergency Preparedness & Disaster Awareness. To aid in the changing of laws, striving for more equality in animal welfare. We are a non-controversial foundation. We our minimally invasive as we only contact you by phone to establish the number of kits need. We raise the funds, we donate at no cost to your department, educate you online and then quietly stay in the background in case you need any assistance. Nothing is more important to us than your pets safety! Our immediate goal is to see one Pet Oxygen Masks kit on every front line vehicle in Southern California. Our secondary goal is to teach you how to properly establish this life saving equipment for pets in your town! 1. Lawful Acknowledgement; Giving pets legal rights to emergency aid. ​2. Legislation; for Pet Oxygen Masks to become mandatory equipment on apparatus. 3. Regulation; to get Pet Oxygen Masks added to the "National Standards" for apparatus equipment list. We are 100% publicly supported organization. and as grant precipitants. Please visit our "supporters". In our first six months of operation as a non-profit in 2011 (July - December) our revenue exceeded $12,000 producing more than 160 kits available for distribution. We passed these figures in the first three months of 2012 by years end our generated funds topped 86,000.00 In 2012. 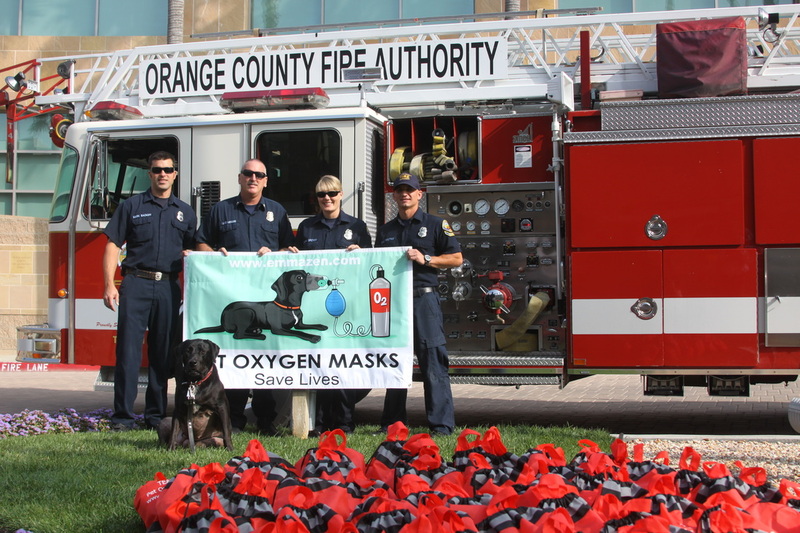 We covered four of Southern California's largest counties including Orange County, Los Angeles County, San Bernardino County and Riverside / Cal Fire County Fire Departments and distributed over 1,146 Pet Oxygen Mask kits in 2012. Our administration fees for 2 years running have only been approximately 9.5%. And we have continued to grow!